After dying in a freak accident, Matt Cahill inexplicably “wakes up” three months later with the disturbing ability to see things—terrible things—that others cannot. Drafted as a warrior in the battle between good and evil, Matt will stop at nothing to destroy the malevolent Mr. Dark. 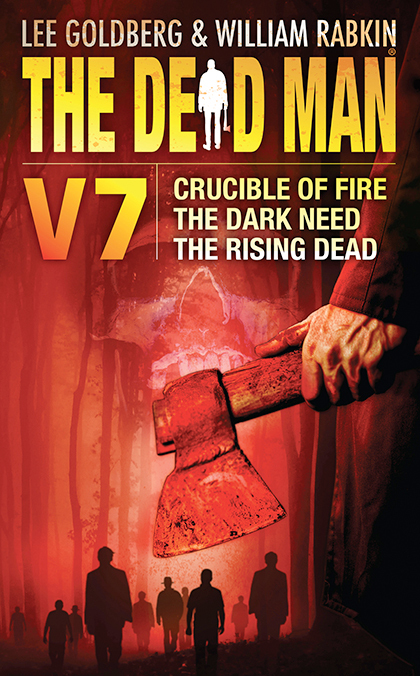 The Dead Man Volume 7 is a trio of sinister new stories tracks the reluctant hero on his nightmarish quest. Matt Cahill is part of a team of smokejumpers who are dropped into the heart of a raging firestorm, a CRUCIBLE OF FIRE that is fueled by a flamethrower-wielding madman who has fallen prey to Mr. Dark’s evil touch. Matt is in dogged pursuit across the icy, Cascade Mountains of a shape-shifting killer possessed by THE DARK NEED for blood and the souls of his victims…but can he catch the monster without falling prey himself? In the blasted hell of the Arizona desert, Matt meets a mysterious stranger who may know how he became one of THE RISING DEAD…and the secret to defeating Mr. Dark.